This sketch was done on another spread with a background prepared in the studio in advance. The sketch itself was done on location at the Maritime Aquarium in Norwalk, CT. 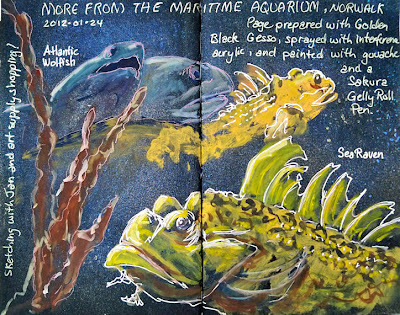 The gouache stood out pretty well against the black and iridescent surface, and the metallic Gelly Roll pens were the perfect defining touch for these eerie creatures of the deep! This was so much fun! (Image can be clicked for a larger, clearer view.) 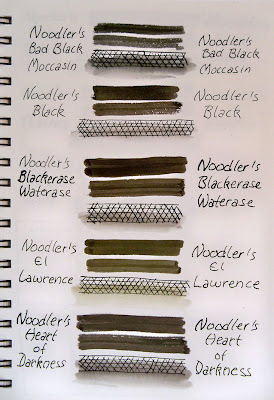 I used Golden Black Gesso to coat a few page spreads in my Stillman & Birn 5.5x8..5" Epsilon hardbound sketchbook, drying each with a hair dryer before going on to the next. One coat of the Golden Black Gesso perfectly coated the paper. I did try a couple of different dilutions of it also, but it was best right out of the jar the way it came. 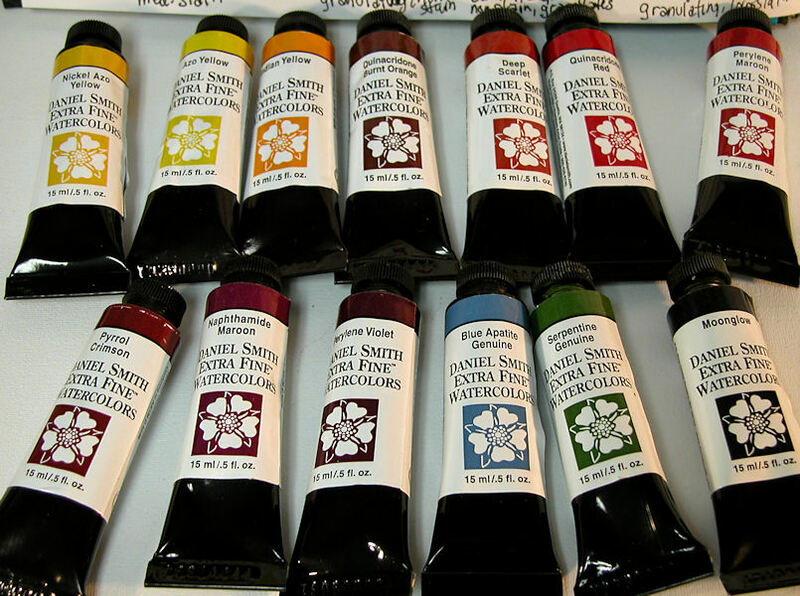 It applied a thin, totally opaque covering of the paper with a single coat. I used an inexpensive foam brush. Then I diluted some Golden Fluid Acrylic Interference paints in spray bottles, using a little airbrush medium, flow release and water, and spritzed each page spread with a couple of different colors, drying them again with the hairdryer. 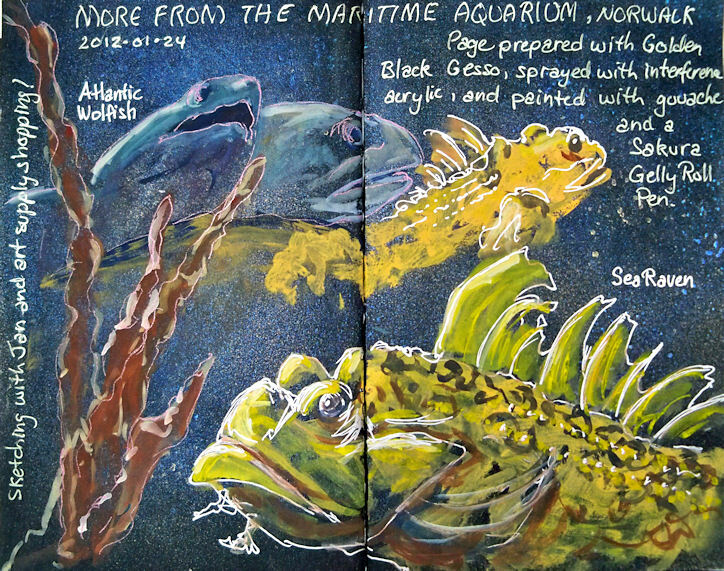 I did this in preparation for a sketching trip to the Maritime Aquarium in Norwalk. 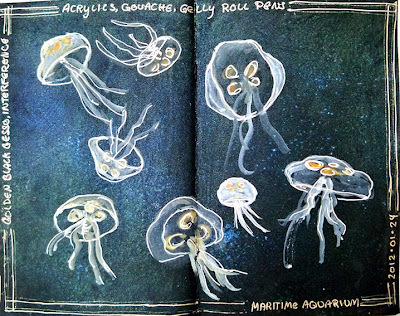 They have a few very dark rooms with extremely interesting things and flourescent lighting, like jellyfish! 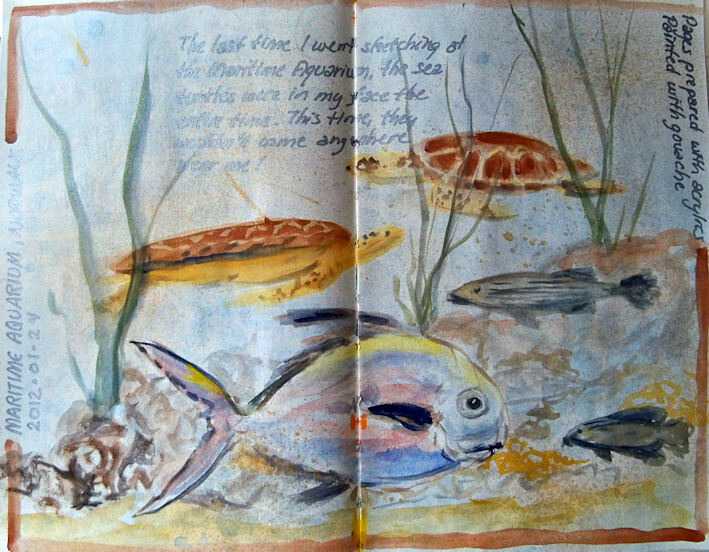 This page in the book almost exactly mimics the dark, flourescent tank they were in. 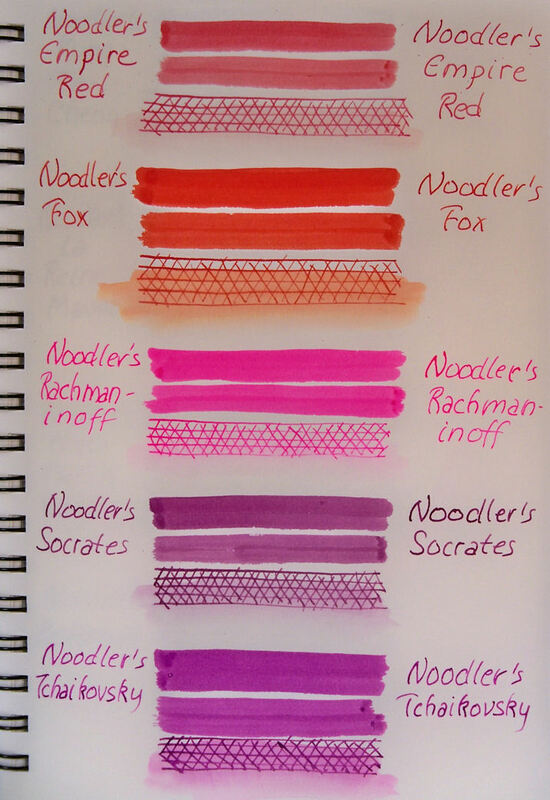 I grabbed a handful of Sakura Gelly Roll pens, purchased at a Jerrys store on my way to the Aquarium, and went to town with them. 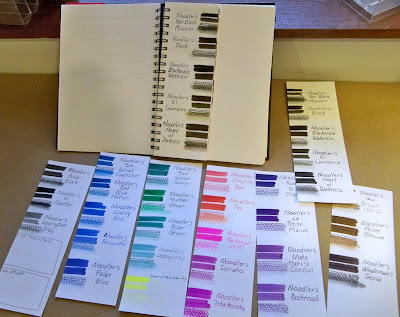 The Gelly Roll pens worked fabulously on the gesso and the paper. They are very opaque, bright and smooth. I am going to get more! 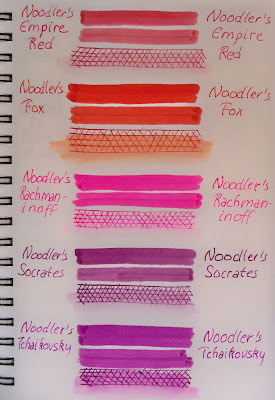 Here's what the Sakura Gelly Roll pens that I got look like on black and on white. 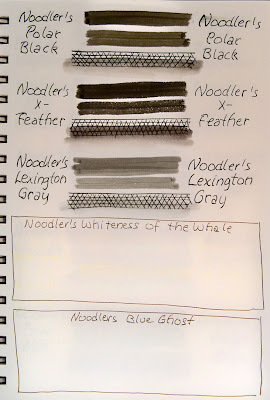 On the white paper, I brushed over the crosshatched sections with a waterbrush to see which ones will wash and which are waterproof. That first sketch was fun, but it didn't give me exactly what I wanted. 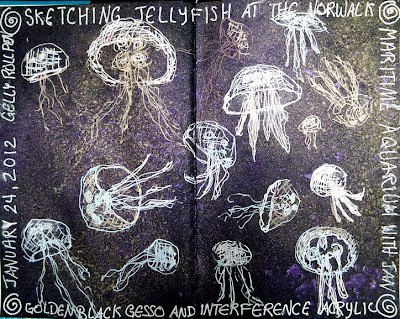 I turned to another black/interference page spread, and this time used gouache with some Gelly Roll pens over the top. I was much happier with this one! This is something that I definitely want to spend more time exploring in the weeks to come! 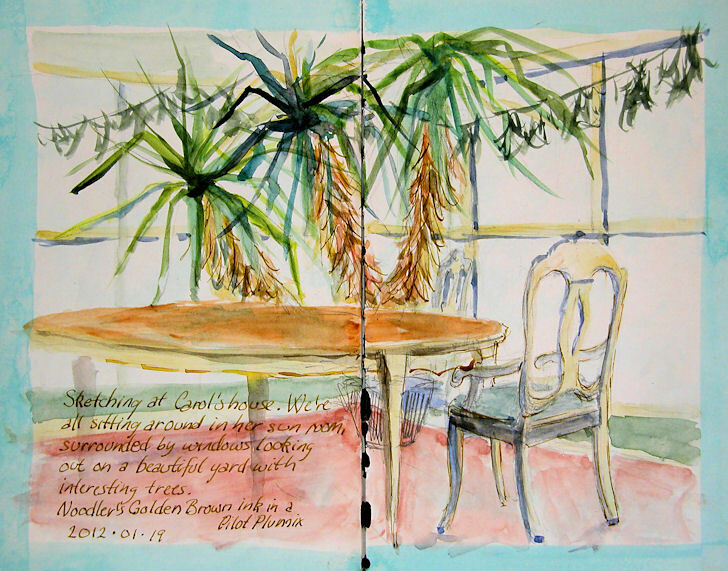 A member of our sketch group invited us all over to her house to sketch her yard from her windows. 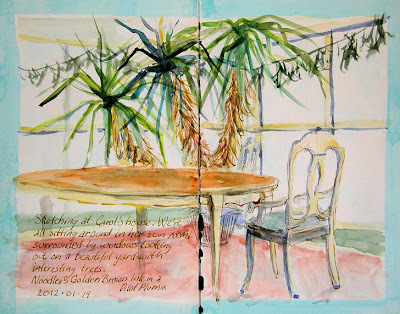 I loved the colors and light in her sun room, so I sketched the room instead! I was walking around the greenhouse at Adams Fairacre Farms in Wappinger, New York. As I rounded a corner, I noticed a little bonsai garden tucked away on one of the display tiers. 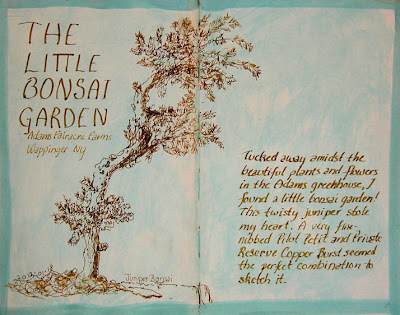 I fell in love with this twisty little juniper bonsai. It made a perfect pen and ink subject. I definitely want to do more of these next time I go back there! 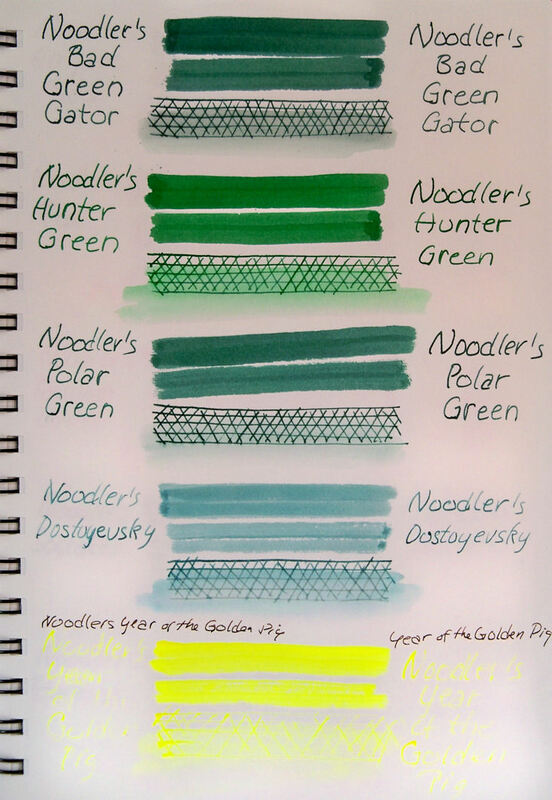 I selected this teal page spread for it's greenish tones, and also because I felt this color ink would stand out so nicely against it. 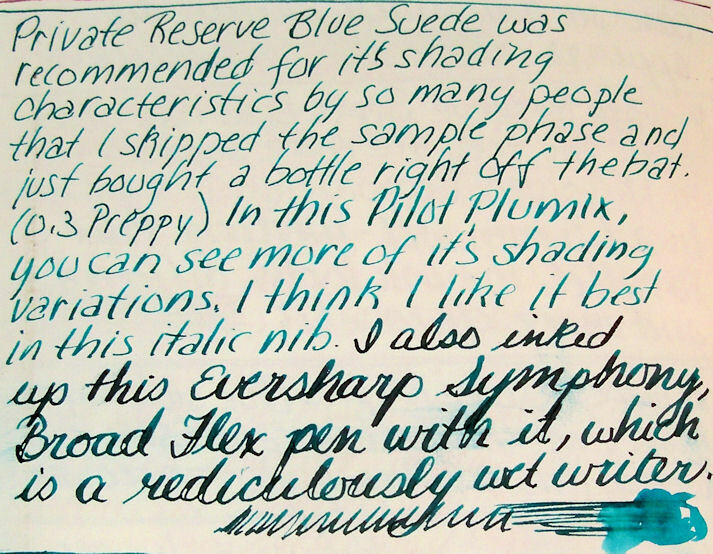 I just got a bottle of this Private Reserve Copper Burst, and it immediately became my favorite brown ink. I have the most challenging time adjusting these iridescent images. The copper is really stunning, but in a photo it looks dull and brown without the shimmer of the light on it. If you can imagine the shimmer that you see in spots, spread throughout areas of the sketch, you'll have a better idea of how this looks in real life. The border and box shadow are copper iridescent acrylic, and there's a light coating on the multi-layered page background too. In fact, that background has eight layers of assorted media on it! If you click the image, you can see through parts of it to various background layers of patterned ink and shapes. 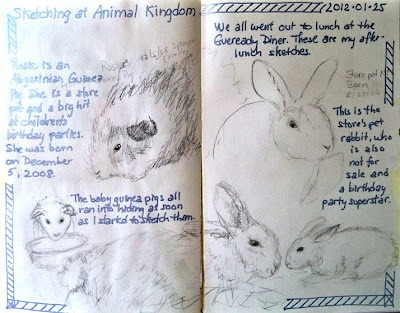 I was sketching at Adams Fairacre Farms in Wappinger, NY this past week. I had prepared several page spreads in advance, including this one with the copper background. 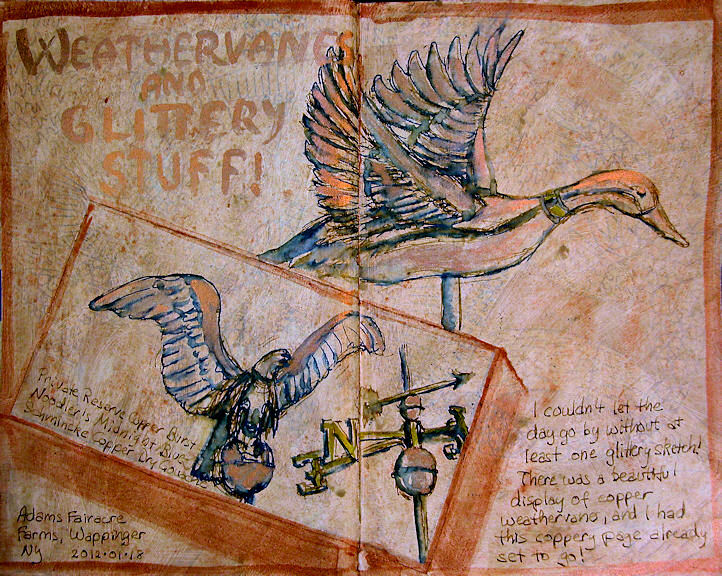 When I walked by a display of large copper weather vanes, I knew I'd found the perfect subjects for those pages! Combined with my love of birds, it was irresistible! 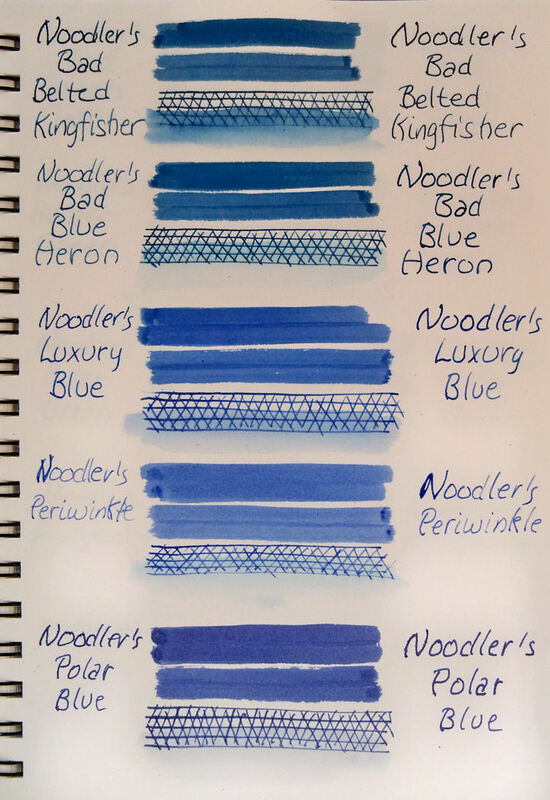 I sketched them with Private Reserve Copper Burst, added some Noodler's Midnight Blue for contrast, and blended/shaded a bit with a waterbrush. 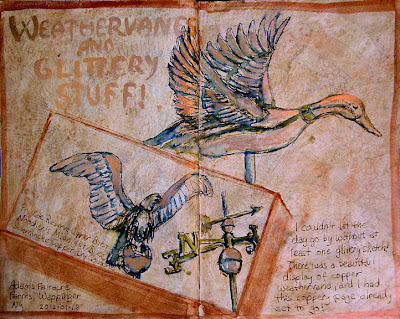 This was a perfect opportunity to dip into the copper version, so I mixed up some of that after I got home, and added it to areas of the weathervanes, and painted the page title with it. 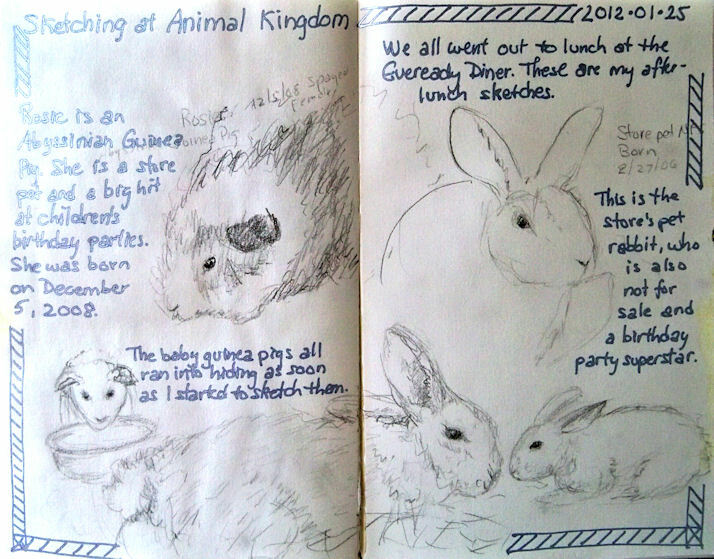 I sketched my little herd across the two page spread using fountain pens filled with the listed inks. 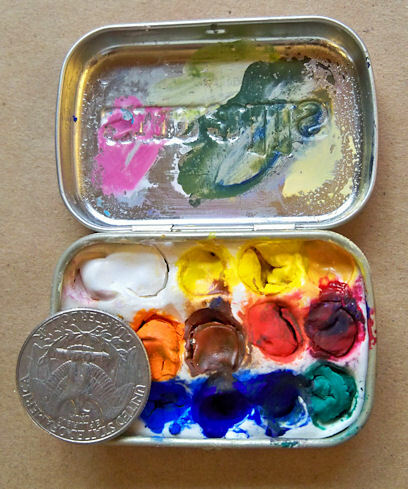 Afterwards, they were washed with a waterbrush. 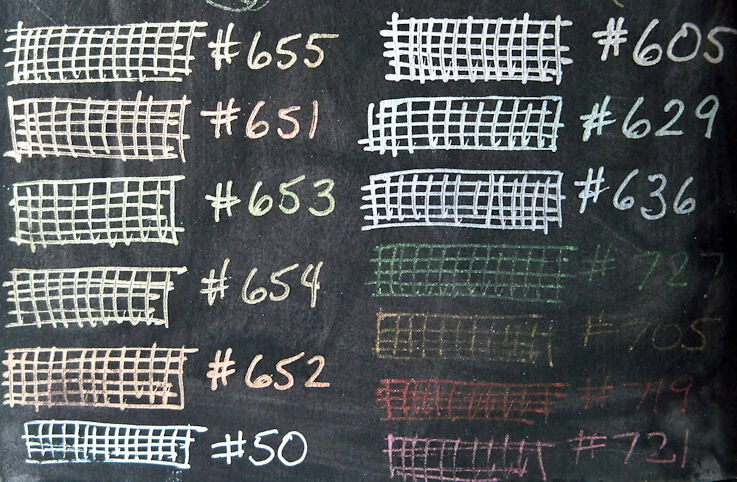 This Gamma paper has an ivory-toned surface that lends itself to certain colors and applications. I like these inks on it a lot. 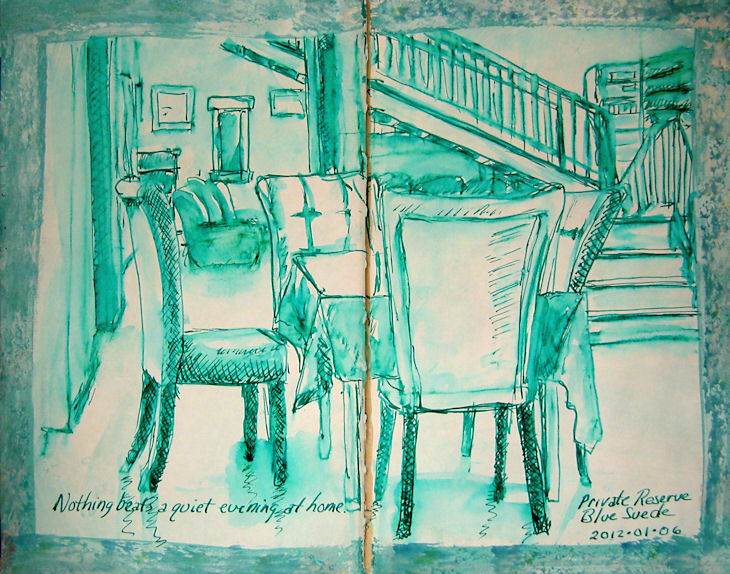 This sketchbook opens up to a large spread of 18". It's nice to have that spacious feel to expand a sketch, and still have room to write a bit! 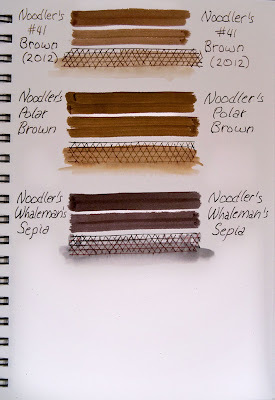 I decided to test drive my new little mini, warm-toned, muted palette in a Stillman and Birn Gamma sketchbook, which has ivory paper. I gave myself the additional challenge of working a two page spread in a landscape format book (6x9"), holding it in a vertical orientation. This made the sketch 18" top to bottom. I cut a paper template with a 2x6" opening beforehand, so I could peer through the window to size up potential subjects and compositions, and get an idea of how they would fit on the page. I'll keep that tucked inside the book. The logistics of actually holding the book vertically and painting this were more awkward than I'd anticipated. 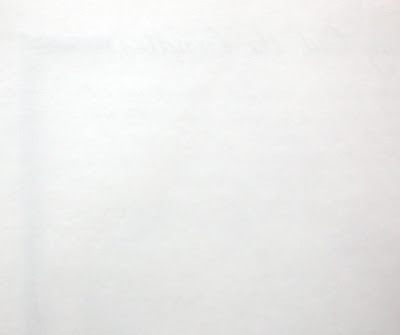 I clipped the book to a 12x18 piece of coroplast, which I'd cut previously to hold open some 8.5x11" sketchbooks. But this book was in fact longer than 18" when open, so it extended past the support a bit on either side. Fortunately, in this instance I was working in my kitchen, which has an enormous granite peninsula. Out on location, it would be difficult to work this vertical format. For a painting that will be matted and framed, I think this vertical 3:1 ratio is a stunner. For sketches that will be seen mostly on a computer screen, not so much! I thought that working this way both horizontally and vertically would be an interesting exploration of 1:3 ratio compositions, and I haven't necessarily changed my mind about that yet. I'm going to pursue some horizontals this way. 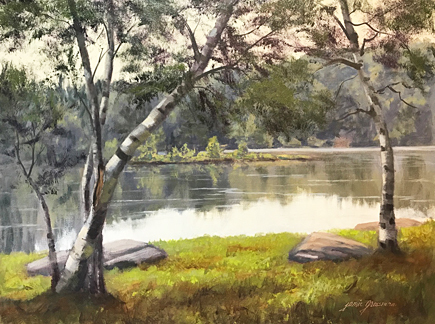 I can certainly see a benefit to the format for many landscape applications as studies for future paintings. More to come as I work my way through this challenge. 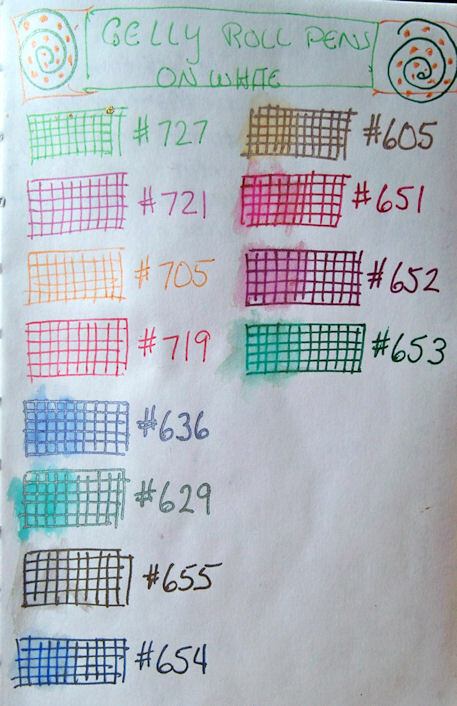 I had an extra mini kids' watercolor palette lying around, so I decided to use it for a limited palette. I chose an assortment of seven muted colors (since there were 8 spaces for paints after popping out the ones that came in the set), plus the white gouache that I always carry along "just in case". 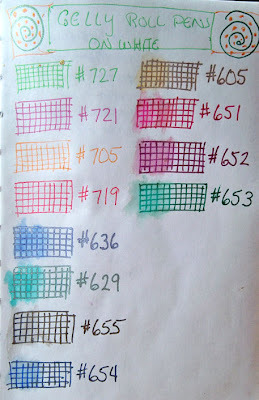 But then I thought, "Gee, seven colors plus white is really not a 'limited' anything!" 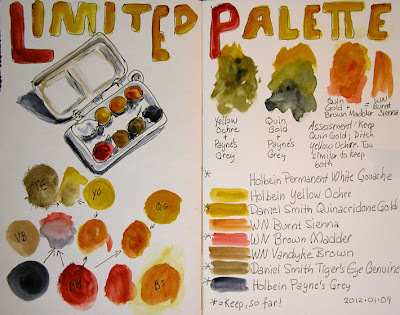 Although I titled it Limited Palette because it's a range of muted colors, that's a term that us usually indicative of not only muted colors, but also just a few of them! I played with mixes and made some determinations regarding what I want to keep and what I'd like to swap out for something else. The colors listed are a starting point, and I expect this palette will be an evolving exploration. I've already ordered some new colors to replace a few of these. 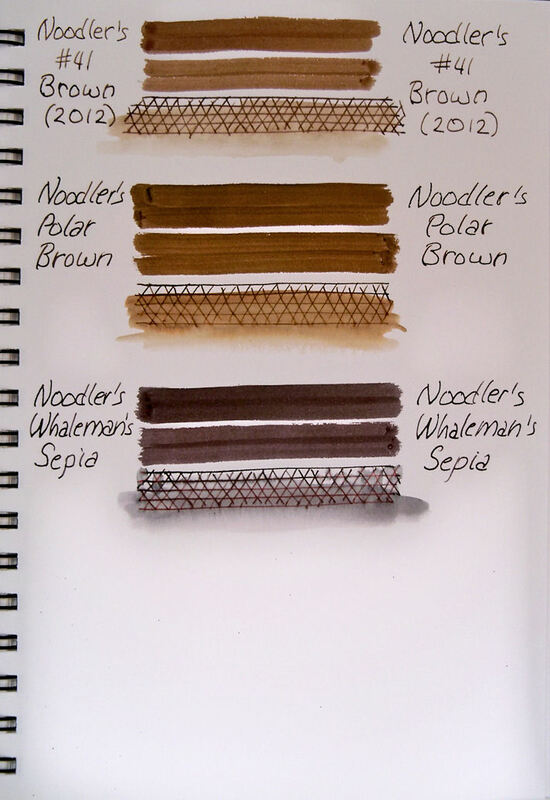 I've been looking forward to using a group of mostly warm colors like these on lightly toned paper --- ivory or peach or some other warm tint. 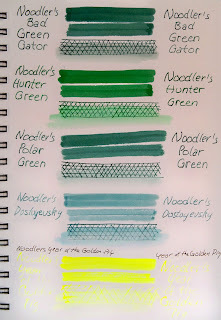 I am really loving the olive greens I'm getting with the Quinacridone Gold and Paynes Grey. You can click on any of the images below to get a larger, clearer view. 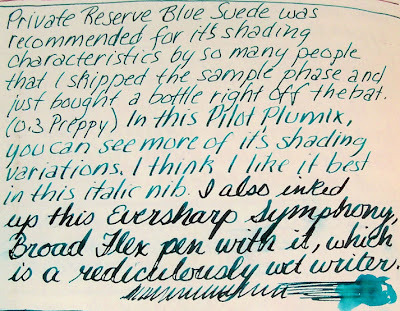 Private Reserve Blue Suede ink is so color-saturated that I probably should have put up a sunglasses warning icon at the top of the post! As winter gets colder, this color conjures up images of clear Caribbean waters and tropical skies. I love it. 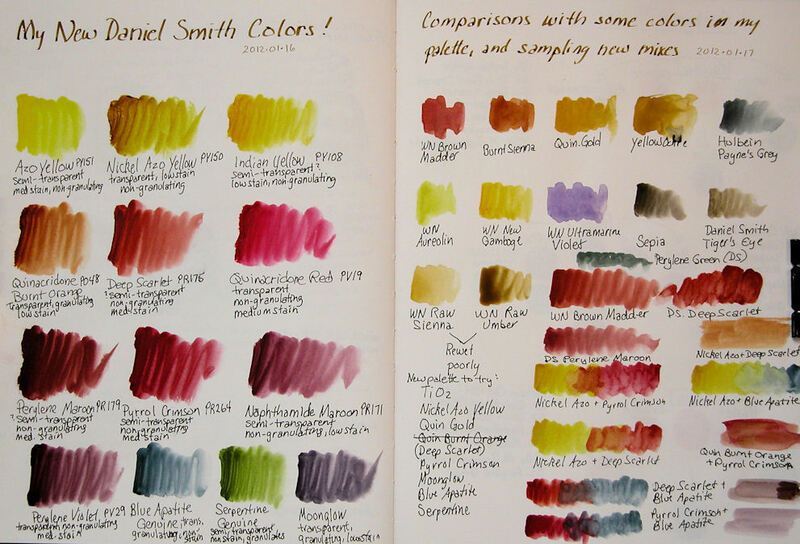 Not only is it colored strongly enough to create great washes, but it also shades when writing with it. 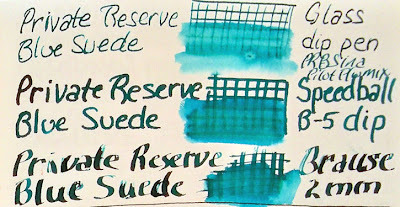 First up are three dip pens. 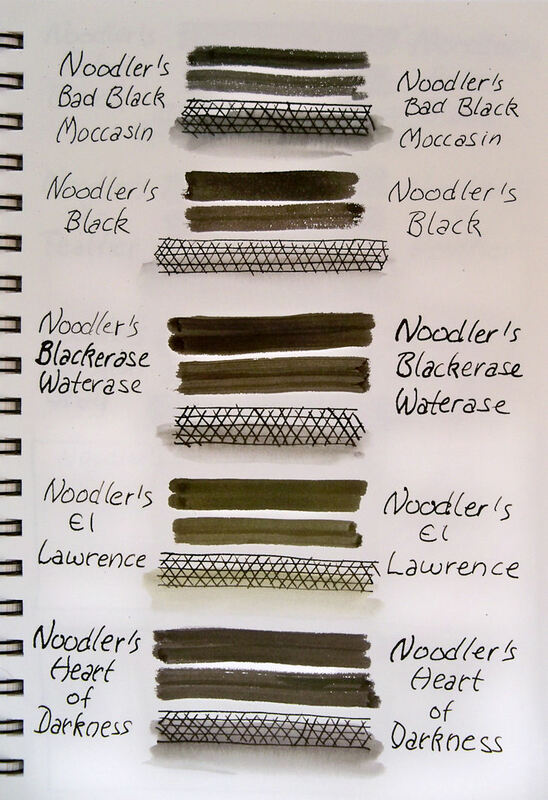 Each crosshatched section was allowed to dry, and then washed with a brush dipped in water. 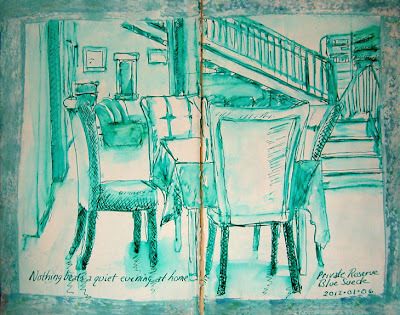 The writing in this sketch was also done with Blue Suede. So, what's not to love? 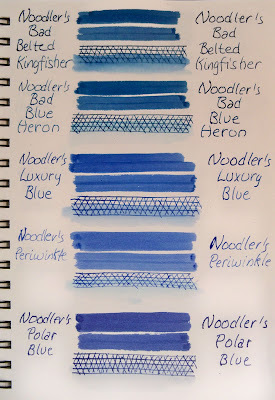 Well, I do wish the ink would hold a bit more line when washing with a wet brush. I had to go back once it was dry and restate some of the linework on the sketch where I had washed a lot, and put the darkest darks back in. Still, it didn't give up the line as easily as many others do. I haven't tested it for lightfastness yet, so we'll put that assessment on hold for now, and I'll start testing it soon, along with some other new samples. 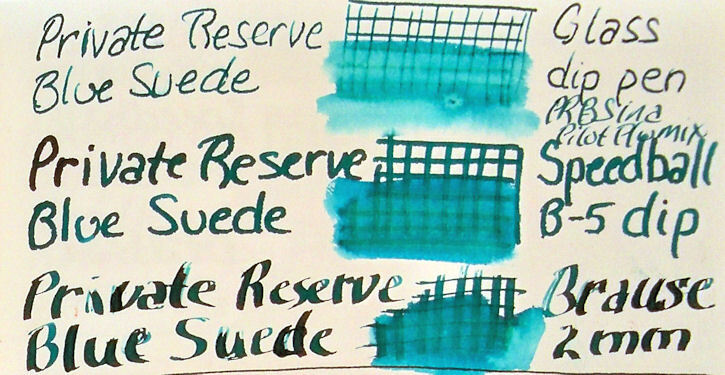 In the meantime, if you love teal and turquoise, you're definitely going to want a bottle of Private Reserve Blue Suede! 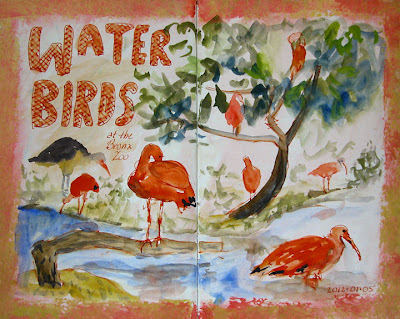 I remembered these red-orange birds from the last time I was at the zoo, so I prepared these border colors in advance and made sure to pack a pen with Noodler's Cayenne ink! I used a combination of the ink, watercolors and gouache on this sketch. 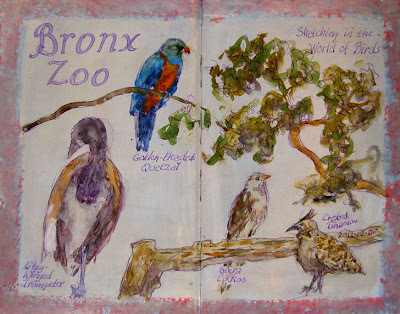 I met with my sketching group in the World of Birds exhibit at the Bronx Zoo. 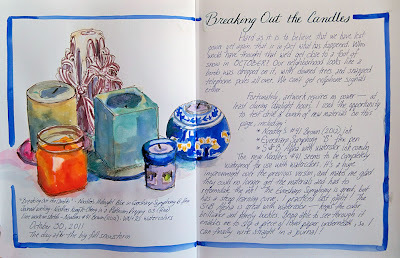 I was especially excited about this trip because I was going back to a Stillman and Birn Epsilon book that I'd only done two sketches in previously, so it was like starting a new book. For awhile I got sidetracked and worked in way too many sketchbooks simultaneously. Finally, I exerted my willpower and narrowed the field, so in the past couple of months, I finished off three of them by consolidating my efforts in one book at a time. 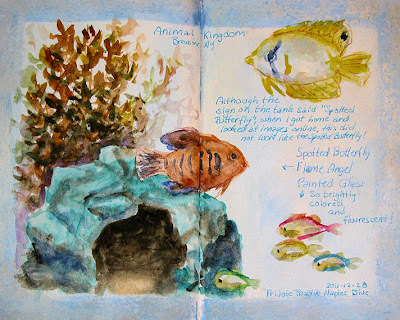 It's been especially hard to let go of the last one I finished --- a Stillman and Birn Alpha hardbound book that I really loved. I did a lot of experimenting and mixed media-growing in that book, and liked what was coming out of it. I wasn't sure where this new Epsilon book was heading. But then I thought about the fact that I treated the Alpha book like a playground. It did well with a mixed media approach and I enjoyed that, so it gave me the chance to grow in that direction. It wasn't long before I remembered how much I love the feel of pen and ink and dry media on this Epsilon surface. I expect that I'll be doing a lot of drawing in the near future! In the meantime, I prepared about 10 two-page spreads with acrylic washes and borders to see how the paper would respond in comparison to the Alpha. To my surprise, it did just fine. 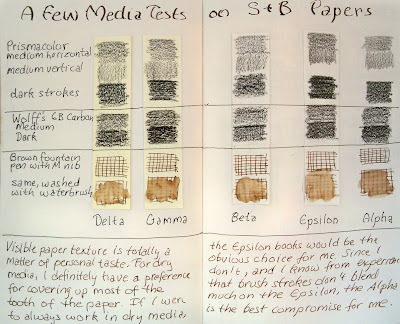 I think I'll not only be able to use a similar approach in this Epsilon book, but I'll like it even more for my dry media. This page was a bit problematic because I didn't dilute the acrylic paint enough on the background wash, and the transparent watercolor did not want to adhere to the shiny smooth acrylic surface. I fought with the acrylic/watercolor combination a bit on this sketch above. 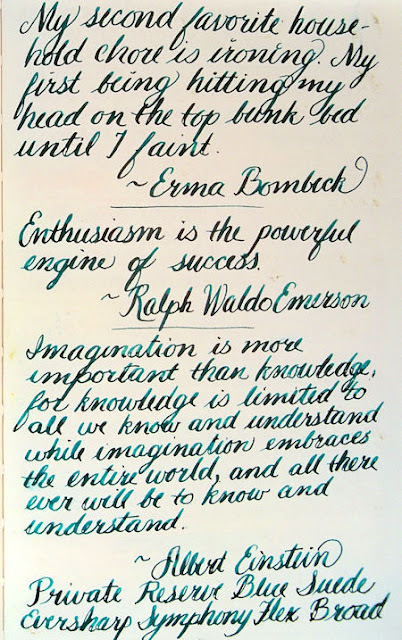 The sketch was done with Noodler's North African Violet ink in a Pilot Plumix italic calligraphy pen. 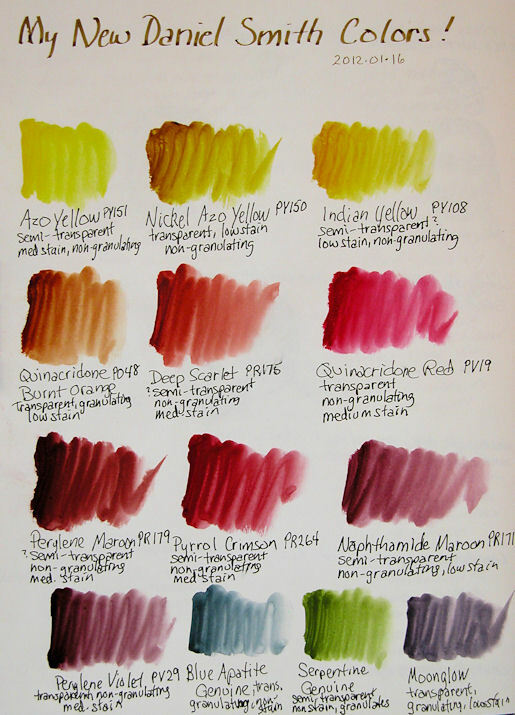 That is a washable ink, and I let it wash into the watercolor at will, and wrote in the species names with the same pen/ink combination. 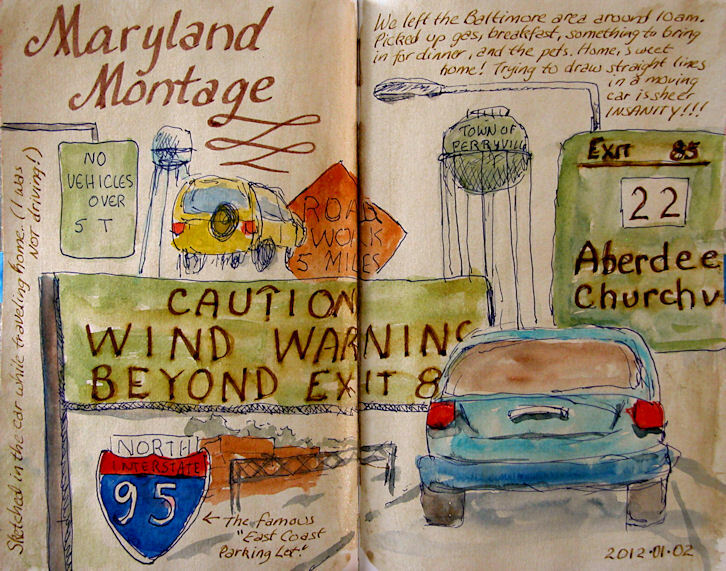 I had some journaling templates tucked into my messenger bag on the way home from Maryland. 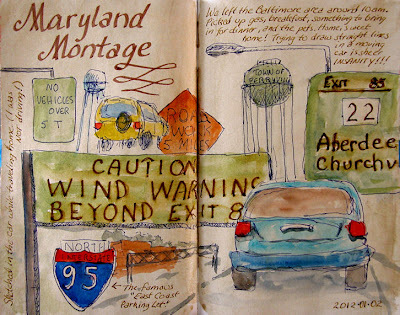 By the time I finished my Maryland Montage, we'd crossed into New Jersey, and I wanted to do something different for the next page spread. I used the templates as stencils for the rectangular shapes -- about the only way to draw straight lines in a moving car! Then I did these little scene captures in ink and watercolor while driving through the state. 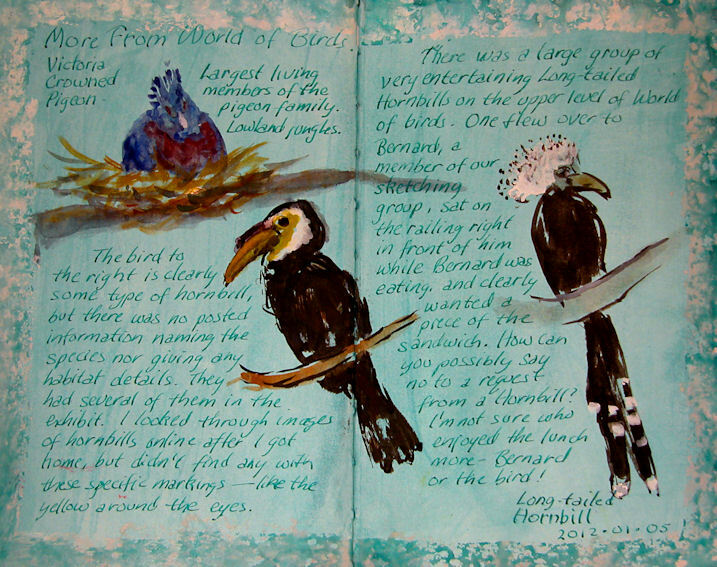 The page background color and border had been previously painted with diluted acrylic. This sketchbook is now finished! 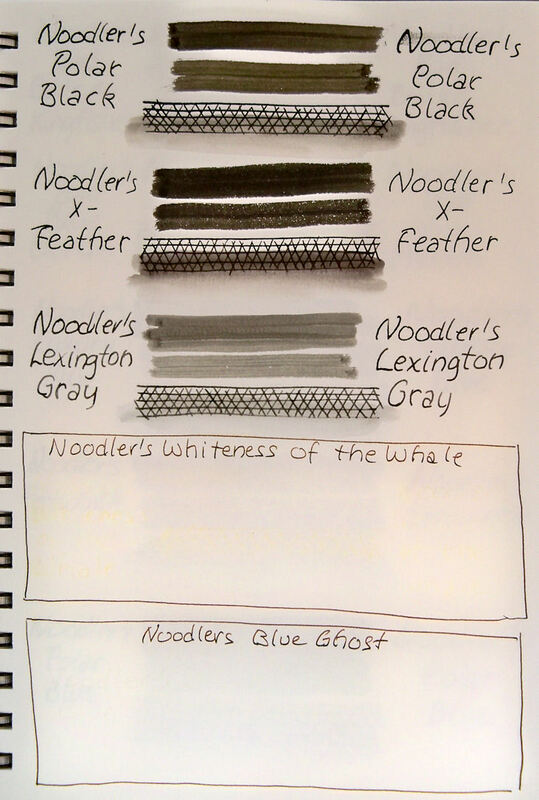 I have a couple of test pages that I haven't shown yet, but I'll be showing those soon, along with a couple of wrap-up review segments about this Stillman & Birn Alpha hardbound sketchbook. 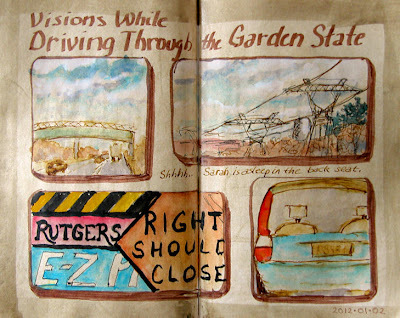 Drawing straight lines, in a moving vehicle at a high rate of speed with potholes and curves, is not going to happen. If you think you don't get carsick, try sketching for awhile! Initially, I was having so much fun that all I could think about was, "Why didn't I try this sooner?" I even did another two page spread after this one, since one remaining page spread was even harder to resist than when there were two left.. By then my stomach was in knots and I was definitely done for the day. I think the next time I sketch in a car, it will be parked! 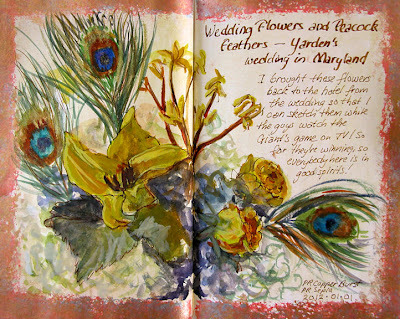 My first big event of 2012 was my niece's wedding! She got married on New Year's Day, so we spent a few days in Maryland to take in the festivities. The table bouquets were white hydrangeas, assorted yellow flowers, and peacock feathers. I got to take one of them back to the hotel with me and sketched it that night during the first half of the Giant game, while the guys cheered on our home team. Even I gave in and watched the second half. Some things are a requirement! The feathers had so much sheen to them that after I finished painting, I mixed up some of the Schmincke dry gold gouache and added some sparkle to them. Unfortunately, that isn't visible on the photo. However, you can see the coppery shimmer on the border from the iridescent acrylics that I used to prepare the page ground and border. 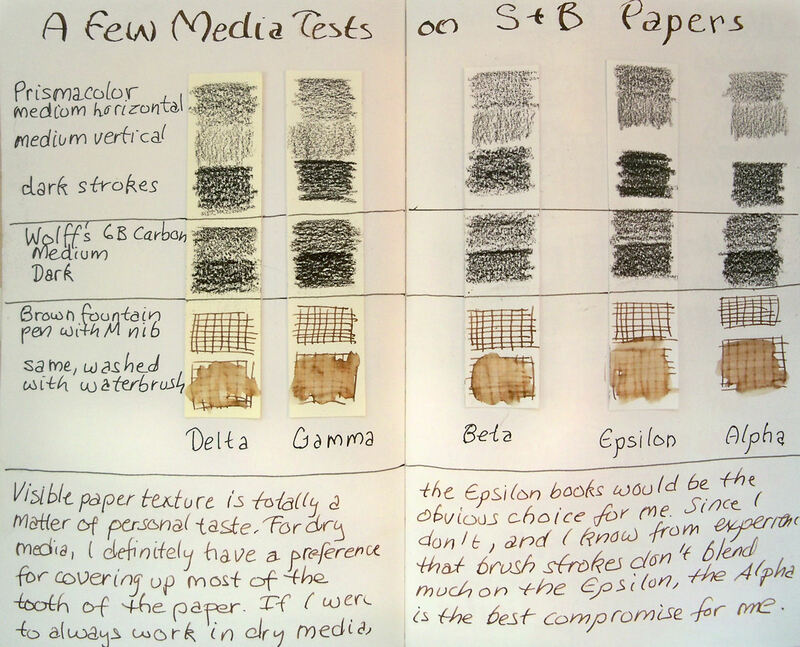 For all of you kindred spirits who share my infatuation with Stillman & Birn Alpha, Gamma or Epsilon hardbound sketchbooks, I have some great information to share with you! 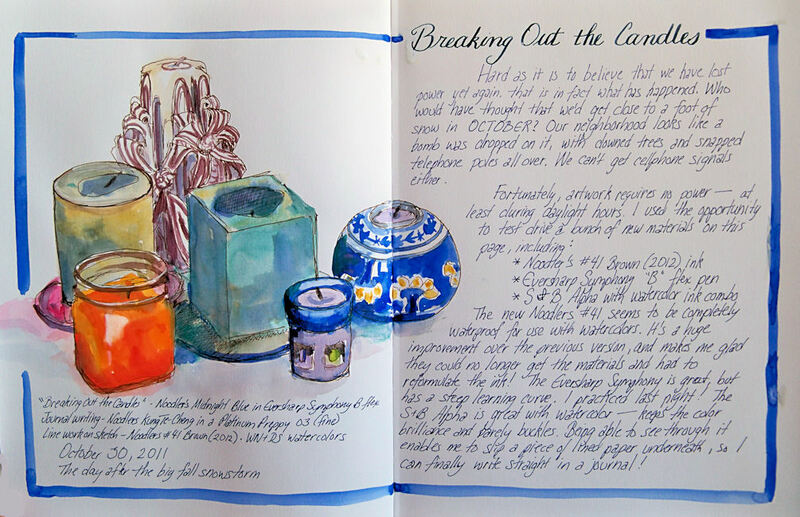 I was talking on the phone last week with Stillman and Birn co-owner Michael Kalman, and he told me that their hardbound books have been designed to open completely flat, and they have a flexible binding! Yep, that's right! In order to achieve this, you have to break in the book before you use it by opening to the center of the book and bending the pages and covers back 360 degrees so they touch. Then go through the book and do that throughout the book, gently bending the pages and covers back. I know you're thinking the whole book will fall apart. That's what I thought, and I would never in a million years have done it if he hadn't told me. 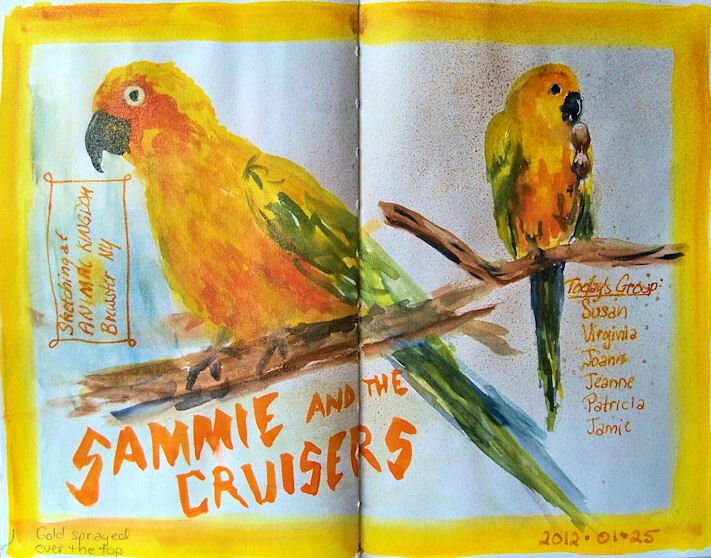 But when I got off the phone with him, I went straight to the new S&B sketchbook I was about to start, and did exactly what he said. My husband walked in and was horrified --- he thought I was destroying the book until I explained it to him. After bending the pages and covers gently all the way back from the middle of the book, I did the same thing from the center of each signature (where the stitching is). Then I again started from the middle, working toward the front, opening every page spread that way; then I did the same from the middle toward the back. Don't use every ounce of brute strength that you have, because if you try hard enough to pull the book apart, you will probably be able to do that! When I was finished going through the whole book twice like that, every single page spread laid down flat. No deep gutters to cross! It was a miracle. I am sooooo excited about this! It works. Try it. 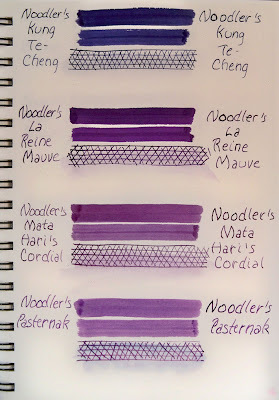 The reason why you want to do this before working in an S&B book is because if you paint across the two page spreads like I do, adding that flexibility to the binding reveals more of the white paper in the gutter area. 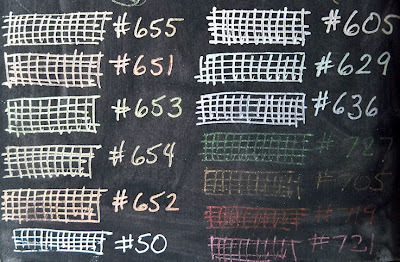 If I were to do it to my almost-completed Alpha book, I'd have a white vertical stripe down the center of nearly every painting I've done in that book. I have noticed while working through the book that as it has broken in a little bit by itself, some of that white in the middle has been revealed on some of the page spreads. Not only will the books lie much flatter by breaking them in ahead of time, but it will also stop those white center areas from appearing later on as the binding gives with use. 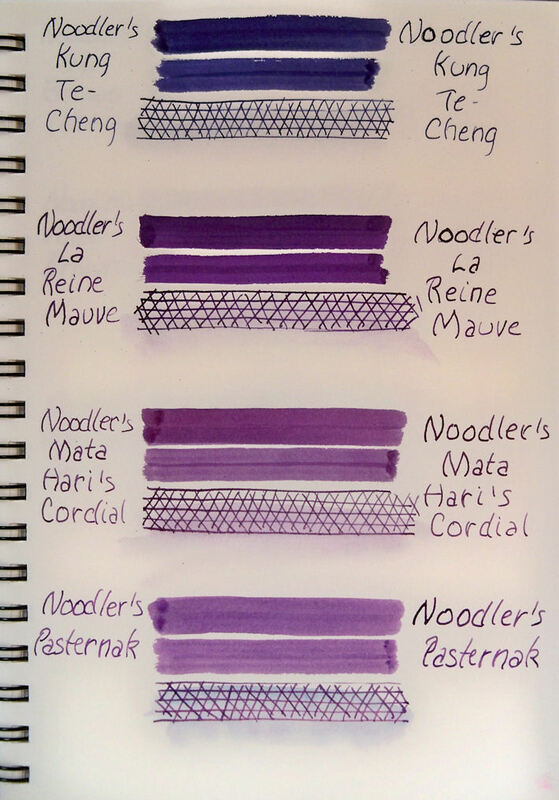 The S&B hardbound books apparently have a triple binding process that involves three different types of adhesion. It is this triple process that enables them to undergo bending the binding and page spreads back that way without damage to the spine, and keeping all the pages intact. This is such wonderful news for those of us who work across the two-page spreads; I had to share!